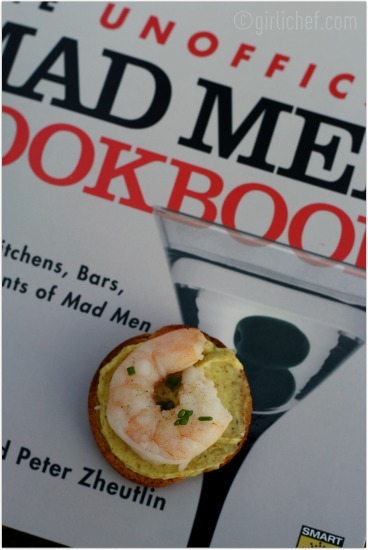 Gelman and Zheutlin have created "a cookbook with recipes for food and drink that either appear in Mad Men, or were served in the 1960's by the bars and restaurants featured in the show". And in honor of the fifth season of Mad Men (premiering one week from tonight), they are throwing a Virtual Mad Men Dinner Party to get you in the mood. 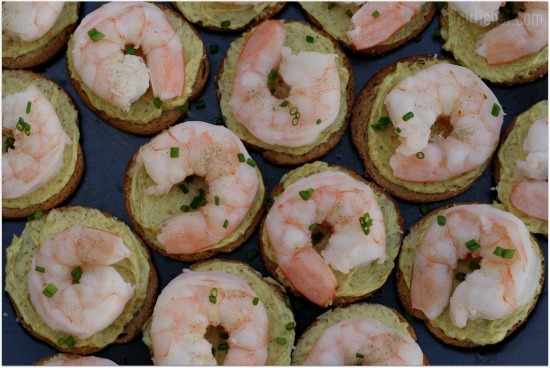 Since I have a copy in my hands, I decided to join in and make one of the recipes I had marked to try, Shrimp Curry Butter Canapés, inspired by "Wee Small Hours" Season 3, Episode 9. A Rockefeller fundraiser was held in the home of Betty and Don and depicted as a typical 1960's-style cocktail party. Cocktails were sipped. Finger foods were passed. I could close my eyes and imagine myself a fly on the wall. fun features: Each recipe in the book is "introduced through a specific scene in the show". Gelman and Zheutlin did their research by scouring period cookbooks, magazines, and advertisements. Many of the recipes were contributes by actual establishments seen in the show (restaurants, hotels, etc.). There is also a great When in New York... A Handy List of Mad Men Haunts section in the back of the book so that you can visit many of the bars and restaurants frequented by Don Draper, Roger Sterling, and other Mad Men characters. Fun! my thoughts/review: Fantastic, well-researched and presented cookbook. The bits of history and period facts entwined with the scenes from the show and how each specific dish/drink presented in the book fits with the characters is brilliant. Fun for Mad Men fans, those who remember the '60's, and those who love to cook and eat. about the authors: Judy Gelman is co-author of The Book Club Cookbook: Recipes and Food for Thought from Your Book Club's Favorite Books and Authors, the first cookbook designed for book discussion groups. the second edition of The Book Club Cookbook will be published in 2012. She is also co-author of The Kids' Book Club Book: Reading Ideas, Activities, and Smart Tips for Organizing Terrific Kids' Book Clubs and Table of Contents: From Breakfast with Ahita Diamant to Dessert with James Patterson - A Generous Helping of Recipes, Writings and Insights from Today's Bestselling Authors. She is co-creator of the online sites The Book Club Cookbook and The Kids' Book Club Book. She speaks about cooking, food, and reading to book and food enthusiasts across the country. Peter Zheutlin is author of Around the World on Two Wheels: Annie Londonderry's Extraordinary Ride and co-author of Life in the Balance: A Physician's Memoir of Life, Love and Loss with Parkinson's Disease and Dementia among other books. He has written for the Boston Globe, The Christian Science Monitor, The Los Angeles Times, The New England Quarterly, and numerous other publications in the U.S. and abroad. 4 oz. unsalted butter, at room temp. Bring 2 cups of water to a boil and salt it. Add shrimp and lemon juice. Cover, turn down to a simmer, and cook for 3-5 minutes or until shrimp are pink and cooked through. Drain and chill. Combine butter, curry powder, coriander, and salt in a small bowl and mix until well combined. Spread each Melba round with a good layer of curry butter and top each with a shrimp (I prefer tail-off...just because these are meant to be popped into your mouth and not fussed with). Sprinkle with salt, white pepper, and chopped chives. 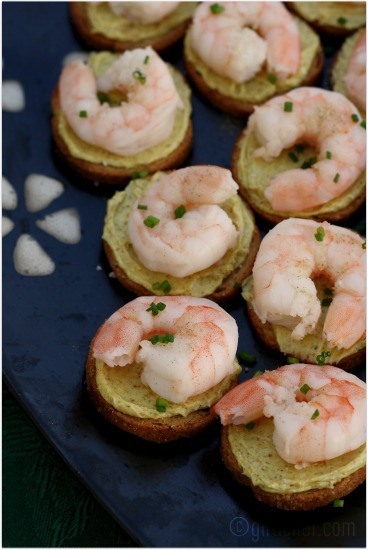 Click on the button below to find more Dinner Party links! *I received a free copy of this book to review. All thoughts and opinions stated in this post are 100% mine.